In this guide will try to show how player can gain high elements on his gears from just worst normal gear part! Can be obtained: Merging 30 normal redstones o 1 Super! Can be obtained: God Soul Shop (price 100 god soul shards per item) OR from Gear Shop (price 5.000 Item|Gear Shards per item) OR as possible drop from Divine Bosses! Any type of gear that still can be upgraded in quality! On server there is exactly 80% chance to gain +7 elements per every quality upgrade! This means you can gain elements whenever successfully quality upgrade happen that was made via red stones or god tears. There are 7 qualities of gear – which means you can perform upgrade with success 7 times. Max amount of element you can achieve this way = 7×7=49 on element! * Only biggest element is counting to bonus! This means if your gear has +50 on all 4 elements – anyway only 1 element will be giving effect! So your aim is to have best element under certain type – so will properly sum up! * You can forge as many gears with elements you wish – you are limited by resources. So if you happen to get not satisfied results you can repeat the process – worse gear sell to someone and forge until you get the best one! * You must decide what you wish to do. You can work on new gear from very lowest one and forge one of best gear part! You can use gear from box – it can be faster and cheaper process but results can be lower then from normal gear quality! * Everytime you upgrade quality elements can be provided on any of 4 types! This means you can gain earth+4 air+2 water+1 or totally different combinations at random way! * If you buy Box X via DS – you will receive gear with +50 elements of all kinds. This gear will be already upgraded in quality to max – you cant make it better in elements anymore! * if you upgrade from normal to Super Divine gear (example any worst gear part) – with success you can gain elements even till +49 amount! * If you upgrade in quality one of gear from boxes (3/4/5) – all of them are under Super quality – which means you will have only 3 more chances to upgrde in order to gain more elements! For example +20 gear you can upgrade 3 times – so you can obtain from it max +21 elements more! 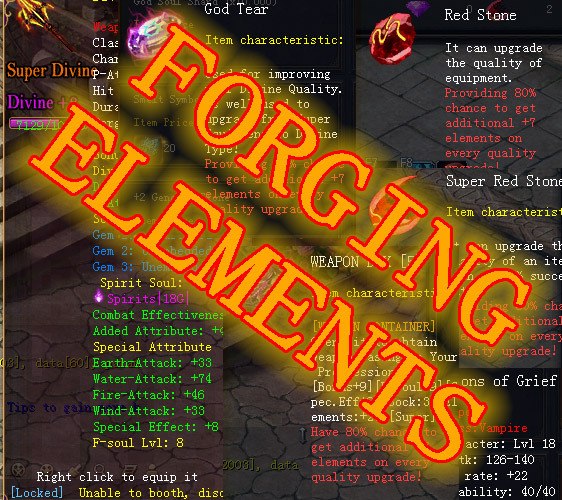 This Forging element system was build in way to make all players obtain beloved gear with hard work without needs to use any kind of DivineStones! Divine Stones can provide player faster way to obtain +50 gear – but its just faster and easier way – this means player that use DS will not be always on better position – just faster gain thats all! 0 Comments ON " FORGING – Creation of High Elemental Gears "